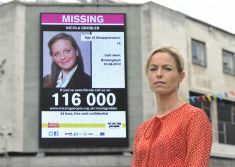 Charity, Missing People, will launch digital billboards nationwide, in cities including London, Birmingham, and Manchester, at rail and underground networks, as well as high streets and shopping centres, through £1 million of donated advertising space. The launch will be an attempt to reach 10 million adults throughout the course of 12 weeks, and will be Kate McCann’s first official role as the charity’s ambassador. This summer is going to be one of the busiest in British history, so is the perfect time for outdoor media space owners to pull together like this and launch such a large scale digital campaign. The billboards will feature photos of the missing people, mainly children, their descriptions, and that all important phone number ‘116 000’, which was launched earlier this year. (We covered the launch here). Using ‘OpenLoop’ technology, staff and volunteers will be able to instantly update the billboards to display information about the latest high risk missing persons. Kate’s role is said to involve lobbying Parliament for better funding, speaking at events, and supporting the families of missing people. She is said to have wanted to help the charity to raise awareness of the issue of missing people as a whole, as well as individuals, and to help the charity as a thank you gesture for their support during their own appeals for missing daughter, Madeleine. Who better to endorse this charity, than a parent who has experienced having a missing child first hand? Madeleine McCann’s case was possibly the most high profile we’ve seen, Kate is likely the best woman for the job to make a conspicuous success of this charity’s appeal. Kate has admitted to repeated neglect of her 3 children. Even after Madeleine asked ” Mommy, why didn’t you come when we were crying” they went out and left them alone again. If Kate was going to be a volunteer (ie not paid) for a charity that warns against these forms of parental neglect the whole world would agree. Now: it’s like making Jack the Ripper patron saint of prostitutes.